About two years ago I invested in a bike with battery power. Very un-Dutch, I know, but we live in a very un-Dutch part of the Netherlands. A hilly part. And since I bought that bike (and Arthur followed suit), we’ve been spending an increasing amount of time discovering our surroundings on two wheels. The Dutch make sightseeing by bike super easy. All over the Netherlands, maps and markers called Fietsknooppunten, (translated, bicycle junctions), route cyclists through the most scenic landscapes that an area can offer, but beware! It’s easy to be lured far afield by the beauty. Just yesterday afternoon Arthur looked up from his scores and called in my direction. Hey! Is it time for a glass of chilled chardonnay at Kasteel Schaloen? Twist my arm. Castle Schaloen is about 10 kilometres away as the bird flies, perfect for a short break by battery-bike. We peddled through pretty villages and forested laneways to arrive in the lush Geul Valley where several castles and manor-farms still stand after hundreds of years. We followed the meandering river, to a courtyard terrace where we sat sipping in the shadow of the fairy-tale fortress. Motivated by the sunshine (and the wine), we chose a different path back home, and arrived at sunset, some 40 kilometres and five hours after opting for our "short break". Our European home is in Zuid-Limburg, that little tail of the Netherlands that sticks down between Belgium and Germany. The landscape here is so different from the rest of the country that even the Dutch come down here in full holiday mode to walk, cycle, and sit on sunny terraces. South Limburg has an international feel, and there’s good reason; the borders here, formed just 180 years ago, are a new development compared to the castles, farmhouses and half-timbered villages flanking fields and filling valleys. Cycling through the rolling hills, it’s easy to flow across borders, and hardly know you’ve left one country for another. When we moved into this neighbourhood over a decade ago, Arthur’s son loved to play this game with our Canadian company; Will you go for a little bike ride with me? He’d ask innocently enough. Who wouldn’t say yes to a 12-year-old Dutch boy using his best English? Off they’d peddle through our village, past the Janssenmolen, a windmill built in 1870, around stately Kasteel Doenrade, the oldest castle sight in Limburg dating from 1117, and down a country-lane to the village of Hillensberg, where a few minutes after leaving home he would stop, turn to them and announce with delight. Haha! We are in Germany!! I’m a history buff. It’s not that I know so much about history, but rather, that I am astounded by it. The concept that the castle in my village (yes, I do have a castle in my village) has foundations from 1310, a tower from 1609, and has been owned by the same family since 1779 has me peddling past the front gate several times a week. At the edge of the driveway, I get off my bike and gawk at the setting, doing my best to imagine the golden-age of grand houses. I ponder who has peered out those stately windows over the hundreds of years past. I never tire of the idea that this chateau has stood as the centre pillar to village life for generations. Okay, I’ll even admit to something of an obsession with my local castle. I’m reasonably sure I could recite to you the lineage of the counts and countesses who have called Kasteel Amstenrade home for 700 years. The 11-hectare English gardens are open daily for the public to enjoy, but the castle is privately owned, and I’ve never been inside. More than 100 castles from a bygone era remain in Limburg. Some are open to the public as boutique hotels, restaurants, or museums, but most are still privately owned. So, it will come as no surprise, that my favourite day of the year is Open Monumentendag. In order to keep the interest of the people whose tax dollars go to the upkeep of thousands of Dutch historical monuments, once a year a select few castles, and manor-farmhouses throw open their doors for the public. When I’m in residence in Limburg during Open Monument Day, I’ll be peddling along in search of open doors where I can take my gawking inside, and for a few short minutes, be the face looking out. Hover over the images (or choose landscape on mobile) to see some images of our cycles through Limburg history. This village has been protected as a heritage monument since 1969 because of the well preserved farm-houses dating to the 1700’s. Here is a fietsknoopunt, bike junction, where we can choose the next leg of our journey. 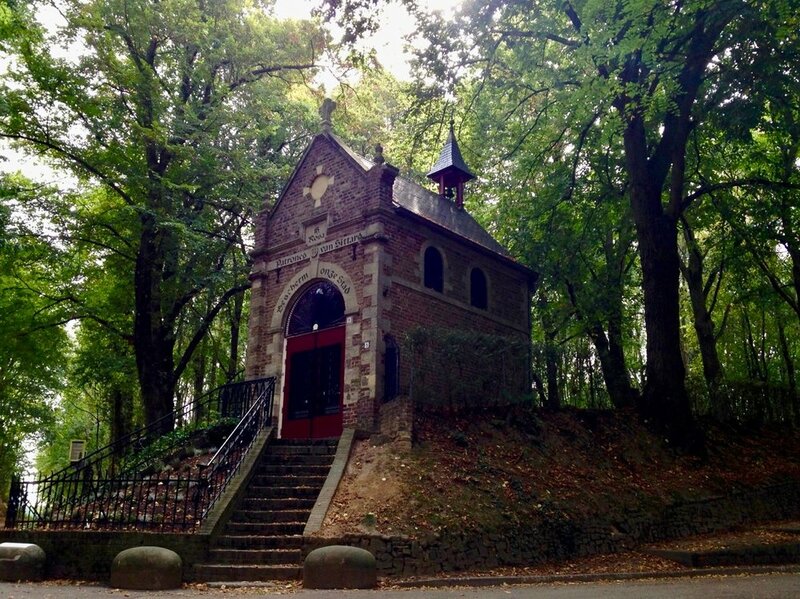 Cycling to the nearby city of Sittard, we pass this chapel in the woods, built in the 1670’s. Limburg has a rich Catholic history. There are many small chapels and monuments throughout the villages and along the trails. The castle view from the drive where I regularly stand to ponder. Kasteel Amstenrade has been owned by the same family since 1779. This castle, originating in 1275, was bought a few years ago by our friend. After a garden party we slept in our roof tent on the grounds. The Maas River forms the 1829 border between Limburg, the Netherlands, and Limburg, Belgium. This free ferry takes cyclists from one side of the river to the other. If I blink, I might miss the border crossing from the Netherlands to Belgium. This manor farm was built in 1615. Most farmhouses in Limburg are courtyard farms, with the buildings forming a square around a small courtyard. The buildings are usually the home, the stable, storage sheds, and an arched gateway. A favourite picnic spot of mine, the Geul Valley has several castles, cafe’s and terraces, and a swimmable river in summer. Here, farms dating back 500 years form a small village that once served the castles in the valley. Look carefully at the gables of this stately home in nearby Nuth, and you’ll see that the year of the home is indicated in the wall anchors. The Mother of all Limburg castles, Kasteel Hoensbroek, in a neighbouring village, is now a museum with year-round exhibitions. Kids can dress up in period clothing, and knights joust in the castle grounds.